Concert season is in full swing with the beginning of summer - whoop whoop! I absolutely love going to a live music show, do you? There are few better ways to spend an evening in my opinion. Raleigh actually has a TON of live music happening. In fact, it has the most live music in the entire state of North Carolina! One of the most frequent questions I get when either attending a show with friends or talking with someone coming to see a show in downtown Raleigh is, "where should we go to dinner beforehand?". 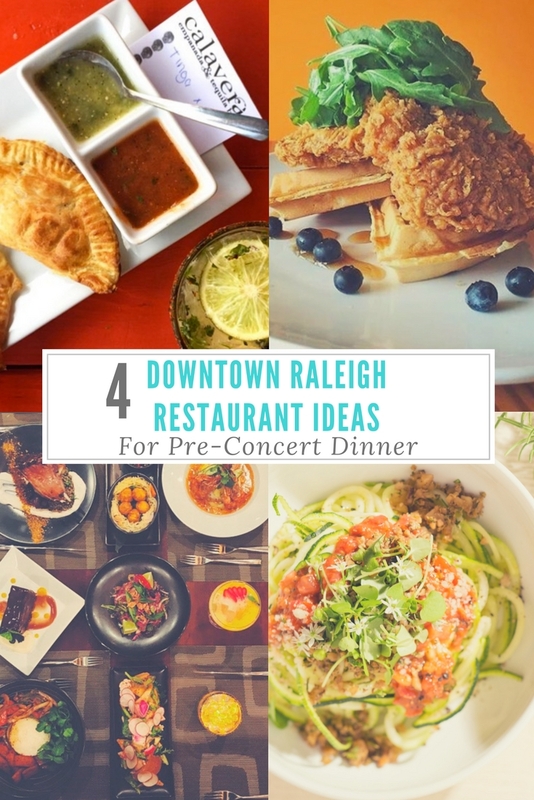 Well, friends, I'm revealing 4 of my favorite downtown Raleigh restaurant ideas to grab dinner within walking distance before hitting a show at one of the many venues in downtown Raleigh such as Red Hat Amphitheater, Lincoln Theater, Deep South, or Kings (and more!) less than a mile apart from one another. They are within walking distance (less than a mile) of the most popular concert venues in downtown Raleigh. They all offer vegetarian, vegan, and GF options. Their delicious dishes will fill you up so you can dance all night long. 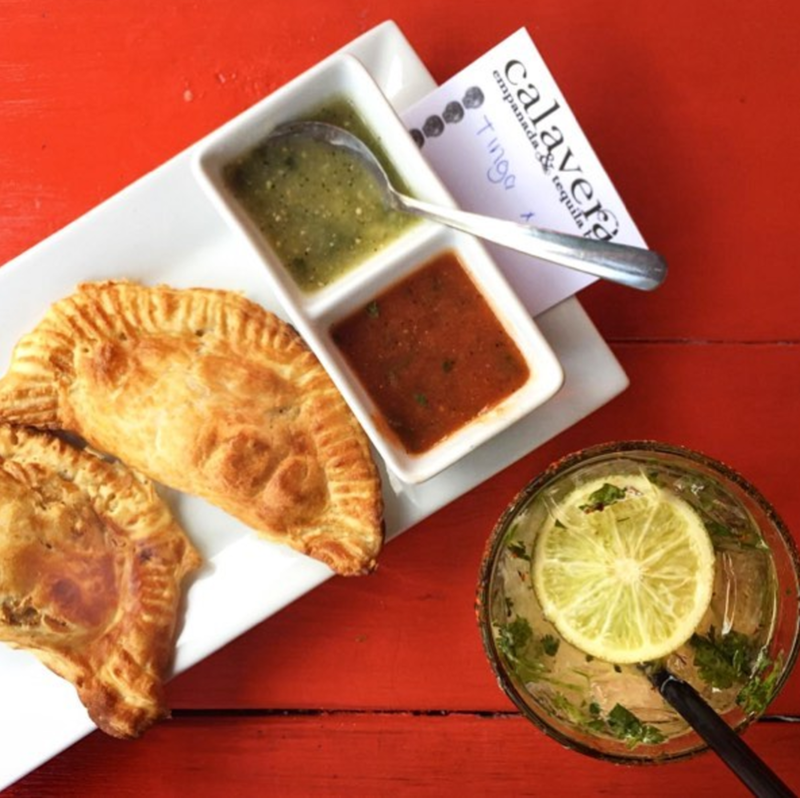 Goodness gracious those empanadas... Seriously, I have dreams about them sometimes. This is a fantastic spot to grab a basket of chips & guac while sipping a margarita and awaiting a warm turnover-style pocket of delicious Spanish goodness. This is a super casual place where you get what you see: a fun, energetic and TASY experience. It's less than a five-minute walk from the Red Hat Amphitheater, Lincoln, & Kings. You can roll up and have yourself a little fiesta in no time before rockin' out at your concert. 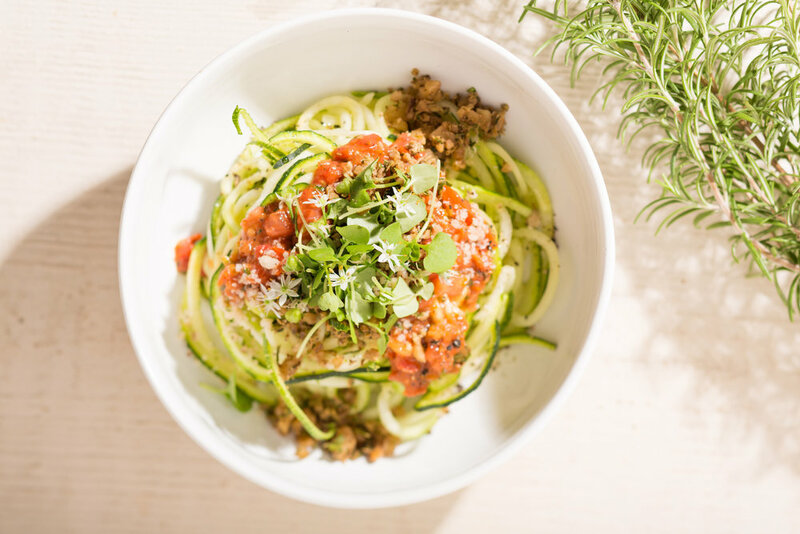 Living Kitchen is an organic, plant-based, and mostly raw restaurant located right in the heart of City Plaza in downtown Raleigh. Let me just say this, the raw manicotti BLEW ME AWAY. I'll admit, as much of a health nut as I am I thought, "how can a menu with mostly raw foods fill me up and be tasty at the same time?" Well, they nailed it. Honestly, everything I've tried in there has been delicious. They are well acquainted with the latest health trends and offer everything from a classic veggie burger (so yum!) to Vietnamese Pho, and a "living burrito". You do NOT want to skip dessert here, friend. Try the lemon blueberry cheesecake, it will chance your life! You could also be super "extra" (just learned that's a phrase - am I behind?) and grab a golden milk or matcha latte. Also, the inside of the restaurant is so clean modern and beautiful you'll be snapping shareable pics left and right before you dive in. *NOTE* - this is not a place to grab pre-concert drinks. You'll be buying your bevy's at the show if you dine here first. bu·ku has SO many of my favorite food dishes. This restaurant is a perfect pick for when everyone in the group is craving something different! It's also a great choice for your foodie friends. They have everything from Gyoza, Flautas, Ramen, and Samosa Pot Pie (you read that correctly). It's a bit of a step up price-wise than the other options, but it's a fantastic culinary experience to kick off your jammin' evening! Everyone at the table can order different dishes and take a sample from one-another. It's located right off one of the main streets in DTR. bu·ku isn't a stuffy, fancy pantsy place where everyone needs to where their Sunday best, but I personally wouldn't recommend rolling in wearing a cut off or short shorts. I don't think they'd kick you out, but I wouldn't feel the most comfortable wearing casual to the max. Feel like you wanna get jazzy with a next-level drink before the show? Check out their libations menu! They have amazing cocktails along with a fantastic beer & wine selection of local products and imports. This is a Raleigh classic to me! I absolutely love this restaurant. No, that is not chicken photographed above, but you wouldn't be able to tell by tasting it! 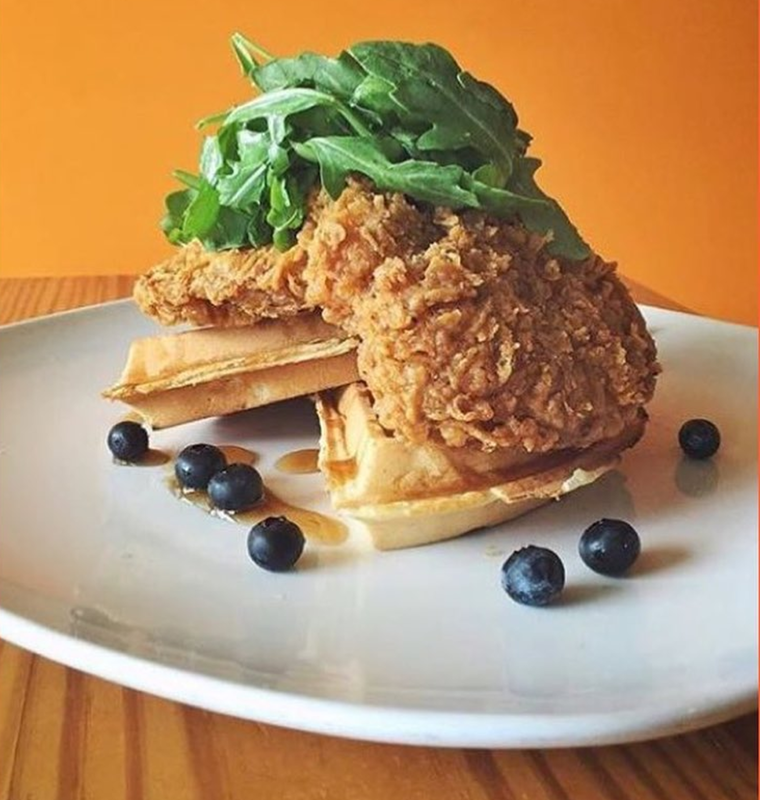 That is their famous vegan "Chicken" & Waffles dish and boy is it tasty. Really, all of their dishes that have any type of meat (Eastern NC Style BBQ pulled "pork") tastes insanely like meat. It is incredible. Their BBQ has been acclaimed for being so fantastic which is a really hard thing to do in a place where folks are extremely critical of anything associated with BBQ. You just have to taste it to believe it. Trust me, no matter how picky, I'm certain you would find something you loved here. Of course there are even more amazing downtown Raleigh restaurants but these are my 4 recommendations to get you started with some dinner options before heading to your concert! They range from somewhat healthy to the extremely healthy for those fit foodie friends of yours (and yourself, of course ;) ). So hopefully you can spend less time thinking about where to do dinner and more time having a delicious dinner before singing your heart out! Do you have a favorite local restaurant to hit before going to a concert? Ever been to a show in downtown Raleigh? If so, where do you grab food beforehand with your health nut friends like me? Throw me some suggestions below, I'd love to know! Here's to great dinners before great concerts and summertime experiences.... Cheers!